Even today I dream ( quite literally) of entering St. Joseph High school building on a monsoon day. I still dream of being admitted to the school and studying in the class. I can clearly see Maniar madam, our English teacher, threaten us with her 'high' English if did not behave. I see late Mr. Prajapati, our Math teacher, holding his own left shirt collar with his right hand and zealously teach us Math. " Is this the way we are going to study ? ", he asks me angrily and flings my notebook on my face. He had curious way of using ' we' for you. He was a tall , dark and stern man who sent shivers through the spines of many. His zeal for Math bordered on fanaticism and whatever minuscule math I have in me, is because of this man. He was not ' nice'. He was a brilliant teacher. He proved that you don't have to be 'nice' and 'friendly' to be an excellent teacher. I still see Mr. Khurshid Pathan, our then Physics teacher demanding the I complete my Physics experiment journals. My palms still sweat at the thought. Mr. Pathan, in total contrast to Mr. Prajapati was nice and friendly, and very popular with girls. I still see Mr. Gupta, our jolly roly-poly Hindi teacher ( who I discovered today is also a poet and astrologer) getting stuck on the descriptions of food in Hindi lessons and struggling to leave them behind. He got struck at the description of baked potatoes in Premchand's 'Kafan'. I can still remember Mathew Kotnani, my friend, tell me with excitement that one of my sarcastic poems have appeared in the local youth section of the Indian Express. This was my first publication. After that I became a public nuisance, and with the advent of the internet and blogging in the twenty first century, I became a global infliction. I can still see the chloroformed frog meant for dissection in the Biology lab regain consciousness and jump on the screaming girls. Today, I suspect, one of the pretty girls from our class must have kissed it and it must have turned into 'fully awake' frog instead of a prince. Women, those eternal optimists, seem to keep on kissing frogs for a long time in their life, and by the time they realize that the frogs will be frogs forever, they have their own tadpoles to nurture. Talking of princes, I also recall one of my classmates whose surname was Champaneri, who often used to come to the school on horseback! 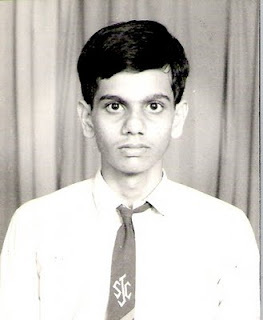 I joined St. Joseph English Teaching High School, Valsad, in 1988, for my eleventh and twelfth standard because I did not have a choice and it seems, St. Joseph's admitted me because they did not have much choice either. I studied in Bai Avabai High School for most of my life and there was no English medium eleventh and twelfth standard for science stream in Bai Avabai school and St. Joseph's was the only school which had this facility in those days. St. Joseph's was the only 'convent' school in our area in those days. My sister had studied there till her tenth standard and it was located at a stone's throw from our residence. 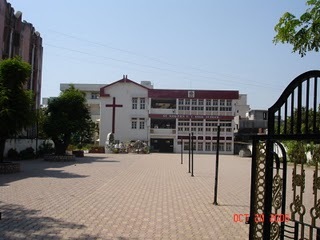 The principal Sister Clara Fernandes in St. Joseph was not very happy at the idea of allowing 'desi', ill-mannered ruffians from Avabai to run freely in the more disciplined and elite school. I remember her giving a very stern piece of mind to the entire classroom for bad behaviour, and her focus was on certain girls who talked 'inappropriately' with the boys. Till I entered the 'convent' I associated 'Sisters' with people who either tied rakhi on your hand or jabbed a syringe into you. I was an awkward outsider who even did not know how to tie a tie. I was a committed middle-bencher. Unlike backbenchers and front benchers, I lived in the grey no-man's land of 'averageness', both in terms of intelligence as well as in terms of capacity for naughtiness. I was in the same place as far as looks were concerned and I marveled at my friend Abhay Thosar's wicked coolness at his being one of the handsomest and smartest kid in the class. He hardly got carried away by girls doting on him. Many of my friends from Avabai were there: Chinmay and Hoshedar for instance. I made new friends with Abhay, Sanat, Rajesh Jainval, Vivekand Pandey, Amit Purohit and Mathew Kotnani for instance. One of the good things about St. Joseph's was that unlike my one year at Kendriya Vidyalaya, Ordnance Factory, Chandrapur, I was not bullied or humiliated. This was the period when asthma became more chronic, and started to pervade my life. I remember this was the period, when on insistence of one Shri Prabhuji, a family friend and a local holy man, I started doing all sorts of trick to get rid of asthma. He suggested that I wake up very early in the morning, study for the twelfth standard with my friend Chetan Patel, go for jogging, or go cycling to Tithal Sai Mandir some five to six kilometers from my house, do ' alni' fasts or salt-free meal days , count beads chanting Gayatri mantra, chant Hanuman chalisa, water basil plant or go to Shiva temple on Mondays. Obviously, all this did not work. I remember sitting on the veranda in the afternoons on the days when I could not attend schools due to asthma attack and watching students of St. Joseph, especially the girls, return home. People expected me to do well in the exams. I scored fifty-odd percent. Baba believed that a person who knows a bit of English and knows stenography will never die of hunger and there was no point in doing B.Sc and work in a factory in Vapi as a chemist from eight in morning to six in the evening. On his suggestion, I took up B.A with English course from Valsad. People were shocked. Arts was seen as the lowest rung of the educational Varnashrama with medicine and engineering at the top. I never even dreamed of doing doctorate and teach in one of the best universities in India. The middle-bencher was basically a day dreamer, and not a dreamer. He sat in the ambivalent middle of the spectrum, and doodled away cartoon characters in his rough work book. He is not difficult to find, just look around you.